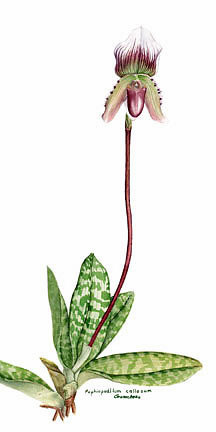 Fine art print of the original watercolor painting of an Asian lady slipper. 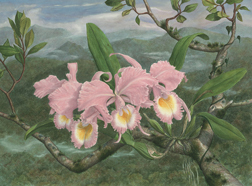 Painted in the traditional botanical method with a white paper background, this lithograph captures all the tiny details in the original work from the fuzzy stem to the hairy warts on the petals and the delicate veins of color in the flower itself. *All Lithographs are limited-edition prints, signed and numbered by the artist.